River Valley junior Kaylee Tucker, with ball, prepares to release a reverse layup attempt between a pair of Wellston defenders as teammate Destiny Dotson looks on during the second half of Thursday night’s girls basketball contest in Bidwell, Ohio. BIDWELL, Ohio — These Rockets were pretty lethal from long distance. 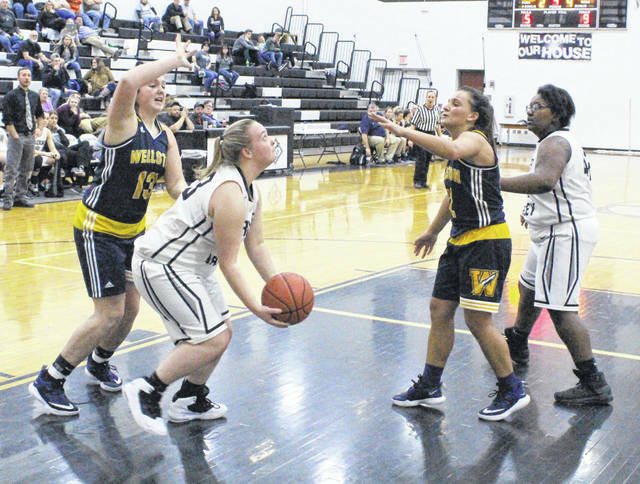 Visiting Wellston shot 56 percent from behind the arc and led all but 1:50 of regulation while claiming a season sweep of the River Valley girls basketball team on Thursday night following a 63-36 decision in a Tri-Valley Conference Ohio Division matchup in Gallia County. The host Lady Raiders (4-13, 0-8 TVC Ohio) built early leads of 2-0 and 4-2 in the opening 90 seconds of play, but the Lady Rockets (7-6, 3-5) countered with a Tory Doles trifecta with 6:09 remaining — ultimately giving the Blue and Gold a permanent lead at 5-4. The Doles basket also sparked a 20-2 surge over the final six-plus minutes of the opening frame, which gave WHS a sizable 22-6 advantage through eight minutes of play. Both teams struggled from the field in the second canto, with the Silver and Black making a quick 4-0 spurt that trimmed the deficit down to 22-10 after a Cierra Roberts bucket at the 5:28 mark. 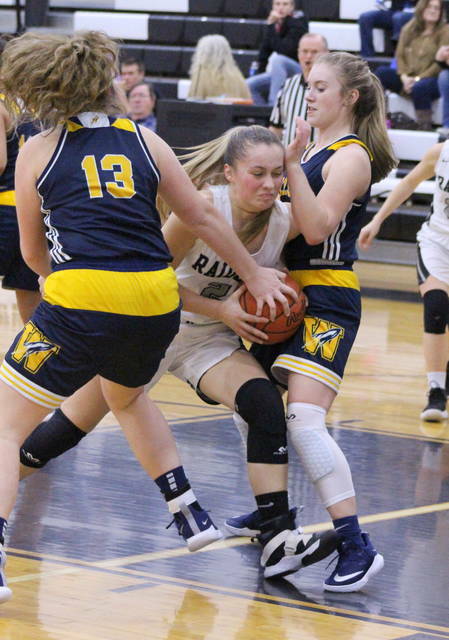 Wellston — which missed six shots and had five turnovers in its first 11 possessions of the second quarter — ended up holding RVHS scoreless the rest of half while piecing its own 4-0 run together, giving the guests a 26-10 cushion at the break. Toles capped a 5-0 spurt out of the halftime gate with a trifecta at the 5:50 mark, giving Wellston its largest lead of the third canto at 31-10. 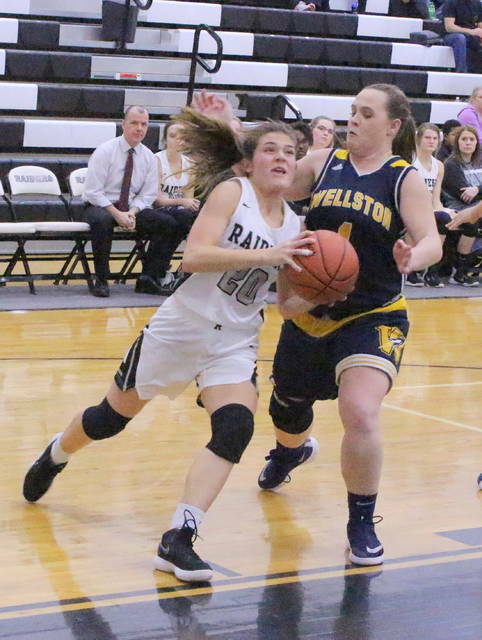 The Lady Rockets, however, were held scoreless over the next four minutes, and the Lady Raiders retaliated with 10 consecutive points and a 12-1 charge to whittle the lead down to 32-22 with 75 seconds left. WHS countered with back-to-back 3-pointers from Emma Jadrnicek and Sydney Mullins over the next 30 seconds, which sparked an 8-3 run to close out the stanza for a 40-25 edge. Kaylee Gillman ended a quick 4-0 run with a basket at the 6:16 mark of the finale for a 40-29 contest, but the hosts were ultimately never closer. The Lady Rockets answered with a 23-5 surge over the next five-plus minutes as Mullins buried a trifecta with 57 seconds left in regulation, giving the guests their largest lead at 63-34. Lexi Stout converted two free throws with 30.9 second left, which ultimately wrapped up the 27-point outcome. The Blue and Gold also claimed a season sweep of River Valley after posting a 62-37 decision at WHS back on Dec. 6, 2018. 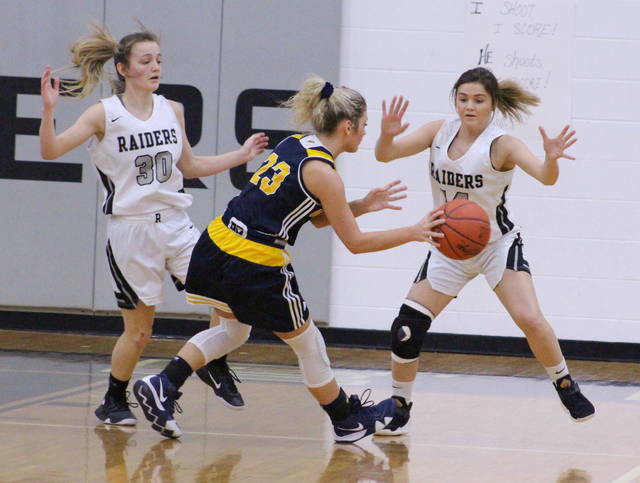 The Lady Raiders outrebounded WHS by a 42-39 overall margin that also included a 16-14 edge on the offensive glass. River Valley committed 26 turnovers — including 10 in the first quarter — while the Lady Rockets had 17 miscues. RVHS netted 11-of-56 shot attempts for 20 percent, including a 3-of-13 effort from behind the arc for 23 percent. The hosts were also 11-of-22 at the free throw line for 50 percent. Kaylee Gillman paced the Silver and Black with 10 points, followed by Hannah Jacks with seven points and Lauren Twyman with six markers. Savannah Reese and Roberts were next with five and four points respectively, while Stout and Kaylee Tucker completed the scoring with two points each. Jacks and Sierra Somerville led River Valley with eight rebounds apiece. Twyman and Kelsey Brown also hauled in five caroms each in the setback. The Lady Rockets made 24-of-64 shot attempts for 38 percent, including a 9-of-16 effort from 3-point range. The guests — who went 6-of-12 at the charity stripe for 50 percent — were also 7-of-10 from behind the arc in the second half. Mullins led WHS with a game-high 21 points, followed by Jenna Johnston with 13 points and Doles with nine markers. Mya Bouska was next with six points and a game-high 11 rebounds, while Emily Kisor netted four points. Jadrnicek and Sydney Spencer each chipped in three points, while McKenna Kilgour and Ashley Compston completed the winning tally with two markers apiece. Johnston and Kisor both followed Bouska with six boards each. River Valley returns to action Monday when it hosts Southern in a non-conference contest at 6 p.m.